Everyone is welcome to this free event at our new meditation space in Salmon Arm! Stress, anxiety and frustration take their toll on our physical and mental health. 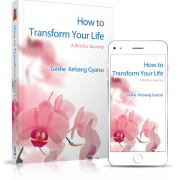 Gen Delek will explain several meditations and transformative ways of thinking that will vastly improve our happiness and well-being. Yes, true happiness is possible and achieving it is simpler than you think! Gen Kelsang Delek is a Western Buddhist nun and resident teacher of KMC Fraser Valley in Abbotsford, BC. She has been practicing and teaching meditation for 30 years and is loved by her students for her kindness, sincere example, and the clarity of her teachings. Her weekly teachings are recorded and listened to in Vernon and Salmon Arm every week, and she visits the Okanagan area 2 or 3 times a year to give special courses.